Oats. Oats and I have had a rocky relationship. I was never a big oat or oatmeal eater at anytime in my life, but I did enjoy the occasional bowl of instant oatmeal as a kid. Not just any instant oatmeal, but Quaker Instant Oatmeal with Dinosaur Eggs! You know the one where as you pour the hot water in, the eggs slowly dissolve and reveal a little tiny candy dinosaur! Haha, those were the best! But then, many years later I found out I had Celiac and Quaker oats were a no go. Contaminated and not certified gluten-free, out of the question. From there, I never really had oats in my diet for a few years except for a small dabbling in Glutenfreeda’s instant oatmeals in the beginning of my gluten-free journey. But Oatmeal was never filling enough for a breakfast for me. I would much rather have a huge bowl of cereal then a tiny bowl of oats (full of sugar in those instant packs). But then I started blogging and saw the love many bloggers had for overnight oats. This wasn’t just oats, but a mixture of many ingredients left to sit overnight and become think and creamy ready to eat in the morning. (I am a thick oatmeal person by the way…watery is so gross!) I knew I had to try overnight oats. I could make them a lot more hearty and filling and it would be easy to grab in the morning. Thus I ordered my first huge bulk bag of certified gluten-free rolled oats from GF Harvest. I jumped right in full force and made overnight oats. I had them about 3 times a week and well…after the first few weeks of this breakfast, I noticed my tummy was not a happy camper. This happened in the Summer so at least I didn’t kill myself before a long school day, but I did eat this when I went away to Washington DC and my stomach hurt on that trip. Bummer! Then I thought I was allergic/intolerant to oats as Celiacs can be even if they are Gluten-Free. So I stopped eating them and was so sad. However when I went to the GFAF Expo I met the lovely people from GF Harvest and we chatted about our Celiac Disease and they suggested I not eat raw oats and try them only once a week in small amounts. The next time I had oats was in granola which is baked and now raw. And guess what?! My stomach was okay! I realized that as long as I baked the oats or thoroughly cooked them I would be fine. So hello granola and baked oats! I still watch my consumption though and never have oats more then 3 times a week, but I do love them 😉 So here I introduce you to my first ever oat bake or “baked oatmeal”. A lot healthier than those instant Quaker packets for sure! Haha! + Preheat the oven to 350°F. + Oil a single serve Ceramic Ramekin. Add in all dry ingredients and stir to combine. Then add in all wet ingredients and stir again. + Cover the Ramekin with foil and place in the oven to bake for 20 minutes. Remove, uncover, and bake for an additional 5 minutes. 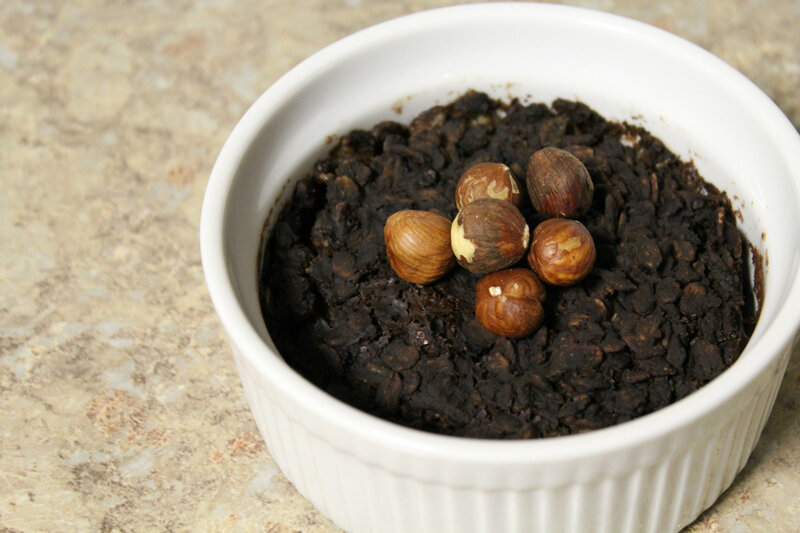 + Top with Hazelnuts or even Hazelnut Butter! Happy breakfasting! Since I don’t have time to bake in the morning, I baked this the night before, let it cool, and then placed the foil back over top, poking a few holes in the foil. Then I just took it out in the morning and heated it in the microwave for about 2-3 minutes. Easy and quick! 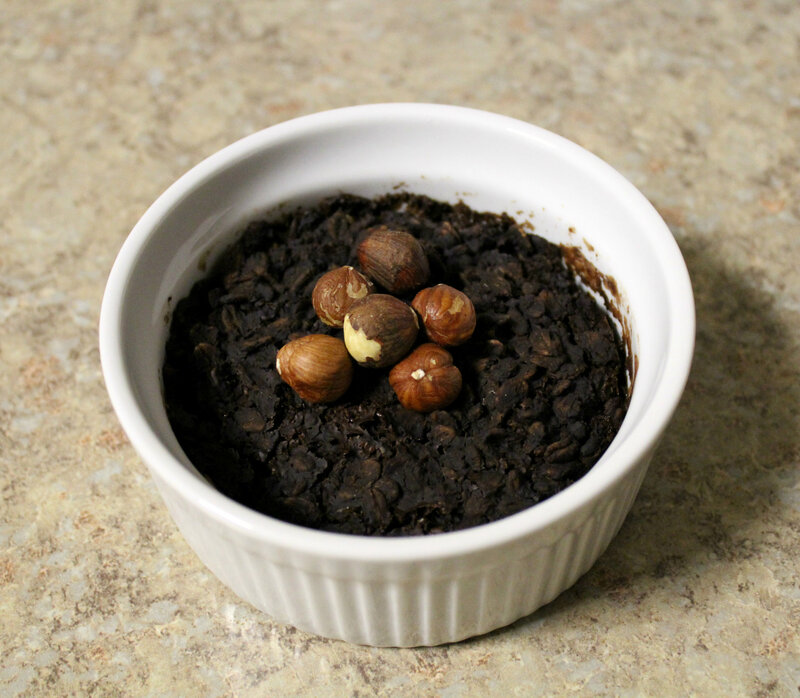 The photos without the Hazelnuts were from the first time I made this. 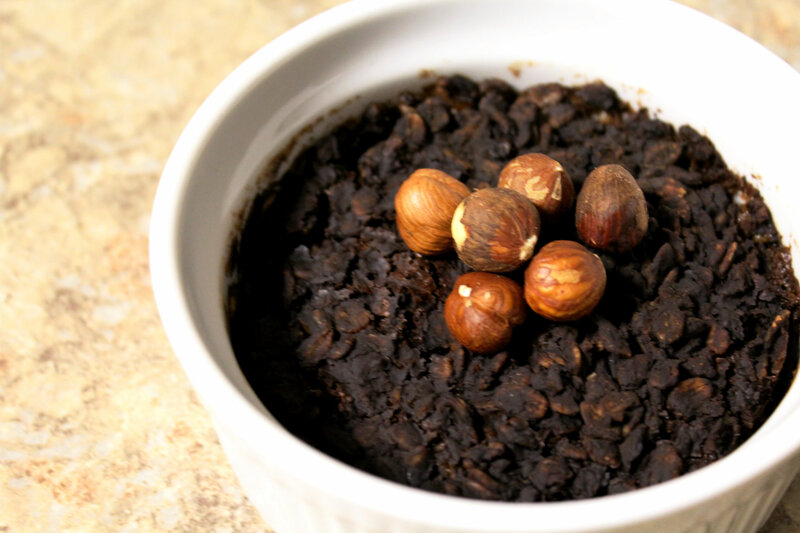 The photos with the Hazelnuts were another time! 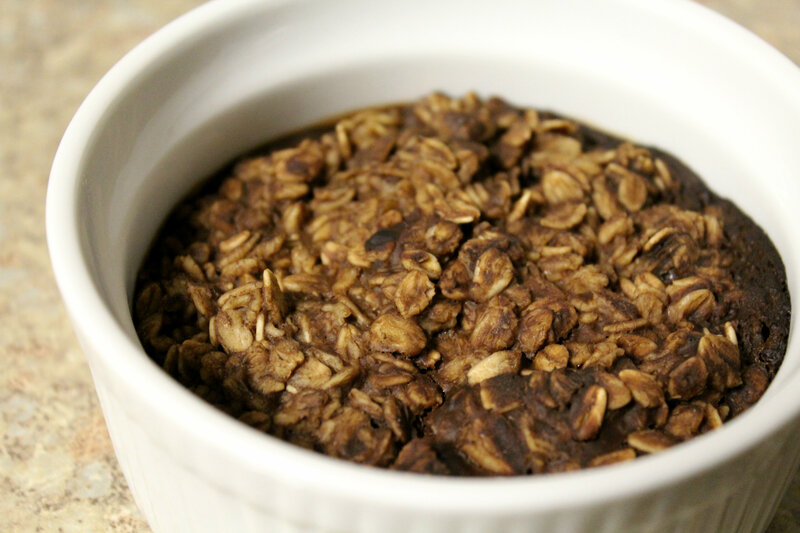 Do you like baked oats, oatmeal, or overnight oats best? What is you go to breakfast during the week? Cereal or granola is the easiest for me to just throw together in 2 minutes. But sometimes I will prep a bowl of quinoa flakes or buckwheat cereal in a bowl with all the dry ingredients, then just add the water in the morning and microwave. This sounds SO good! I’m going to see if I can figure out how to do this in the microwave… Sounds like it would make a great snack, too, for those nights when I need something sweet! Thanks for sharing on the SITS linky! If it comes out good in the micro, let me know! I also have always had trouble with oats – it seems the longer the cook – the less trouble I have with them. I may give this recipe a try, although I have never seen the gluten free rolled oats before. I may substitute regular rolled oats first. Well, if you don;t have a problem with gluten, normal oats are fine! 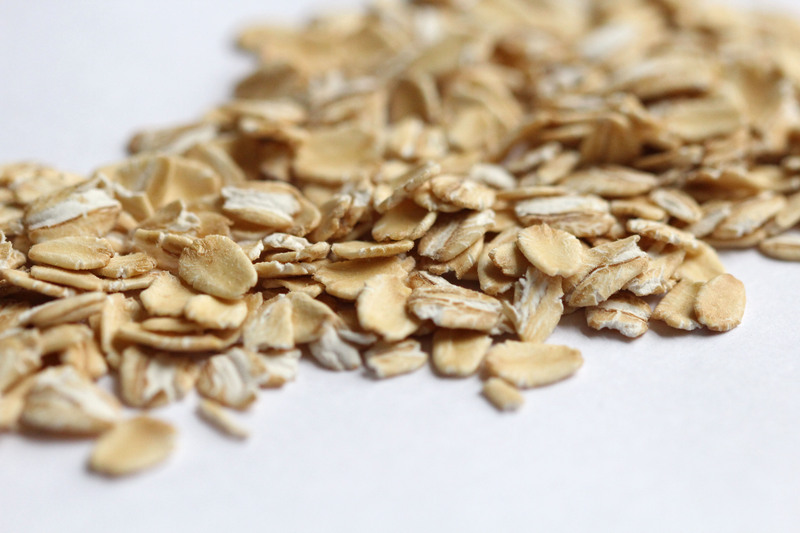 You only need certified gluten-free oats so there is no cross-contamination in the milling process. Wow- this looks delicious I am a huge fan of chocolate and oatmeal together!! MMM! I try to stay grain free and that works pretty well for me, but this does sound like a great idea for many people. Hopefully someday I will be able to eat some grain. Thanks for sharing on Real Food Fridays. 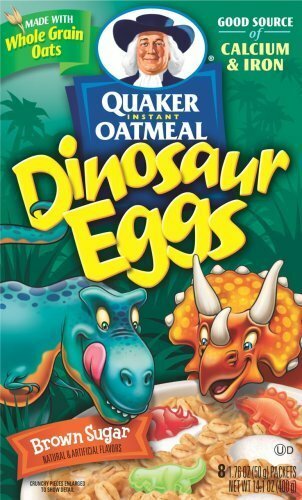 Oh my gosh, I used to adore dino eggs oatmeal. I would literally throw a tantrum in the middle of the grocery store if my mom wouldn’t buy them for me. This looks great, I have been loving coffee in oats lately! Yum! Great idea. I have oats most days and love it! I definitely can’t eat them raw though and sometimes even struggle with granola. I think my stomach must find it hard to digest or something! I’m a huge cereal fan 😛 I miss the days when I didn’t know any better, and would have it for lunch too! Haha. I pretty much only eat cereal for breakfast on a weekend now for a treat because most ones I like are just too high in sugar and carbs…I like a big bowl! Oats are a tricky thing! But yes, cereal is always lovely! My favorites are pretty healthy so I don’t worry about eating to much. Plus when I make a huge bowl I use at least 3 different kinds! I like variety, haha!